Earlier today, Dylan visited the BUILD Series to discuss American Assassin with co-star, Taylor Kitsch and director, Michael Cuesta. HQ photos from the event can be found in the gallery and if you missed the interview, you can watch it below. 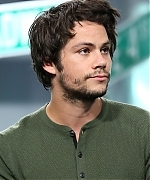 CBS SPORTS – Actor Dylan O’Brien joins Tiki and Tierney to discuss the premiere of his new movie ‘American Assassin’, and his experiences growing up in New York. CBS THIS MORNING – The world met fictional CIA super agent Mitch Rapp back in 1999 in a series of novels by the late author, Vince Flynn. Now the character is moving to the big screen in “American Assassin.” Stars of the action thriller, Dylan O’Brien and Taylor Kitsch, join “CBS This Morning” to discuss their new film with actor Michael Keaton.